Many adults do not consume the recommended 4.7 g of potassium per day, according to Ohio State University's Linus Pauling Institute. Potassium is used by the body for contracting muscles, keeping balance between the water inside and outside the cells and proper enzyme function. You can increase your potassium levels by eating foods containing this nutrient, fruits, vegetables, meat and milk. Oranges are a source of potassium. Oranges are a good source of potassium, providing 237 mg each, and a 6 oz. serving of orange juice provides 372 mg, according to the Linus Pauling Institute. This is approximately 5 percent of the 4.7 g of potassium per day recommended for most people. However, athletes and people who consume a lot of sodium may need even more potassium than this, as athletes lose potassium through sweat. You should consume equal amounts of sodium and potassium, according to Colorado State University. Getting the recommended amount of potassium through your diet may provide a number of health benefits, such as reducing high blood pressure. A diet rich in potassium may also lower your risk for kidney stones, osteoporosis and stroke, according to the Linus Pauling Institute, which notes that getting potassium from foods, such as oranges, is preferred to taking potassium supplements. 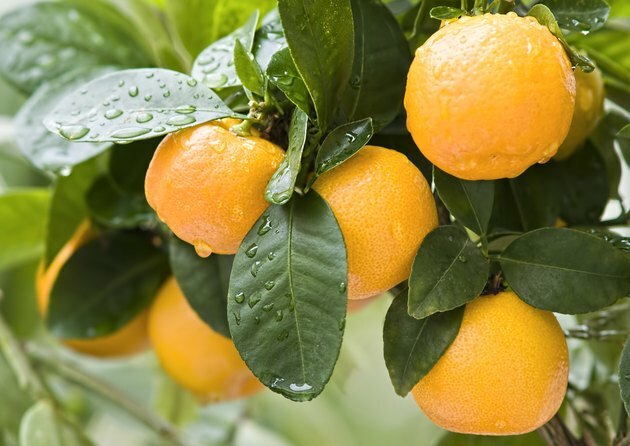 Oranges' potassium content pales in comparison to other fruits. For example, a cup of avocado, breadfruit and figs each contain more than 1,100 milligrams of potassium, and several dried fruits -- including apricots, dates, pears, raisins, prunes and bananas -- also offer more potassium per cup than oranges. Processed foods usually contain added sodium, which can affect your sodium to potassium ratio, so try to eat fewer of these foods while eating more potassium-rich fruits and vegetables to lower blood pressure, recommends Colorado State University. Many with high blood pressure follow the Dietary Approaches to Stop Hypertension, or DASH diet, recommended by the American Heart Association. The DASH diet emphasizes eating lots of fruits and vegetables and minimizing salt intake. Potassium may also help the body to get rid of more sodium, as well as balancing out your sodium intake.